That's Sew Chenille Heart Banner: For this darling Chenille pigmented heart you will learn how to create Chenille with various types of stitches. You can create a single pennant or multiple to create a banner and share the love. 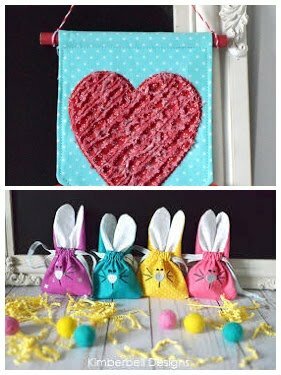 So "Hoppy" Bunny Ear Cinch Bag: Some bunny is going to be very happy to receive this adorable bag filled with Easter Treats! This bunny comes in two different sizes and is Kimberbell's most innovative designs. You will be learning how to layer and line this Cinch bag, along with adding ribbon to this in the hoop project. Kimberbell's Embroidery Club consists of two embroidery projects each month. We are combining Kimberbell's 12 month club into 6 months offering two projects each month. Bring your embroidery machine to learn unique embroidery techniques each month and leave with at least two finished projects. Choose to come monthly or sign up for the entire club. All embroidery machines brands welcome. Designs, directions and KITS ARE INCLUDED. You just show up with your machine. Each session is $40 or get all 6 classes for $180. OR if you want to tackle these on your own, you can pay for all 12 Dealer exclusive Kimberbell designs up front for $69 and receive a BONUS USB Stick AND BONUS 13th design! Must have an embroidery machine with at least a 5" x 7" hoop.